Today we bring you the 10 selected teams that will participate in the local part of IMAGINE IF! in Barcelona. 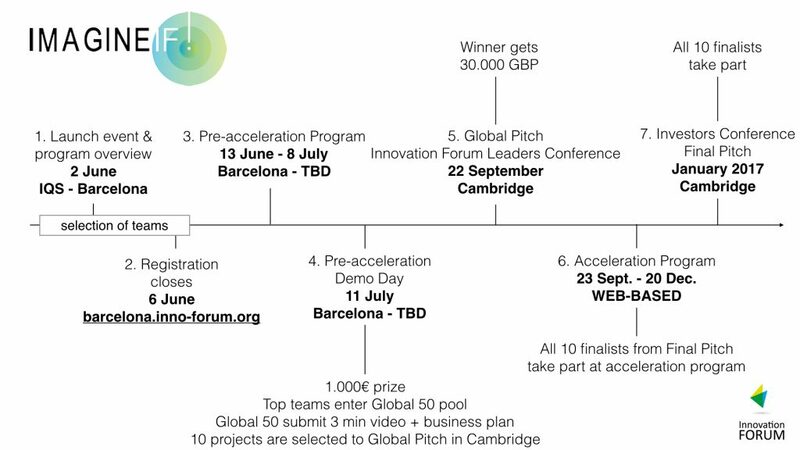 These teams will be engaged in the tailored workshops and mentoring prepared by the Innovation Forum Barcelona team and partners. Selecting them was a very difficult task due to the high quality of all participants but here they are (scroll down to learn a bit more about the projects). We need to thank all the partners and teams that applied. It is clear to us now that deep-tech entrepreneurship has a bright future in Barcelona and we’re very happy to be part of the ecosystem. The chance to improve life through scientific innovation! And please stay tuned by subscribing our newsletter. We use technology to improve productivity, focus, creativity and wellbeing at work. We’re building a B2B deal-making platform for the commercial-scale renewable energy market. We help our users to master moments of stress. iBreve makes tracking & improving emotional well-being easy. iBreve analyses individual breathing patterns and makes smart relaxation suggestions based on aggregated pattern recognition and users´ activity data. As children with Autistic Spectrum Disorder (ASD) tend to be socially isolated, the simple interaction that artificial intelligence can offer nowadays has proved to stimulate them positively. (3) be a playmate for the child, increasing his/her motivation to cover the therapy plan. IOMED puts an end to the problem always faced by medical doctors: struggling with complex, bad-designed systems to store medical records. We provide doctors the solution they deserve: an easy to use, yet advanced tool to generate, store, search and analyze medical records. MOWoOT is a non-pharmacological, non-invasive, no side effects solution to chronic constipation in form of a wearable medical device based on pneumatic technology with connectivity to smart devices. We are a healthcare start-up (visit newborn.solutions) developing the Neosonics, the first medical device to non-invasively screen for meningitis, a preventable infection causing 105,250 neonatal and 151,000 child deaths every year, and significant life-long sequelae among 30% of survivors. Early recognition determines prognosis but lumbar puncture (LP), invasive and potentially hazardous, to draw a sample of cerebrospinal fluid (CSF) is the only method available to confirm/exclude the diagnosis. If CSF white blood cell (WBC) count is increased, aggressive antibiotic treatment to cover meningitis is immediately administered while waiting for bacteriologic results available after 48h. I am Kay Eckelt, doctor of genetics, data-scientist, elite triathlete and the founder of NX≈SWIM | Barcelona. Our mission is to make swimming more accessible, more effective and more fun, for everybody … which, nowadays it isn’t. Therefore, we developed “treadmill for swimmers” that consists of a swim harness, a sensor and a mobile app. Like this, you train efficiently even in smallest pools in hotels, gyms and homes. The app analyzes your swimming, coaches you and gives warnings in case of injuries. You can do virtual competitions to yourself or big stars (Michael Phelps & co). Our social mission is to help those who can’t swim. In this hyper-connected world, there are specific groups that are consistently left behind. We aim to close the mobility gap between the visually impaired and the rest of society. In Europe, there are 912.000 blind people and approximately 12 million people with significant visual limitations.Many will be able to benefit from highly advanced assistant technology being developed by OmniCane in the form of a unique pedestrian guidance device. OmniCane combines a series of sensors, electrical actuators, and micro-controllers to better asses the user on its navigation path and provide them with tools to leverage their disability. This represents a huge jump from the traditional cane since it increases their safety and obstacle detection while enhancing urban navigation using state-of-the art technology. Panakeia, a company formed by a multidisciplinary group of people coming from new technologies world. We want to apply this new technologies in eHealth because we think there are still several problems where technology could be the key of their solution and new technologies can help people to have a better life. After an initial research, Panakeia will offer an integrated solution for chronic diseases to monitorize, control, prevent and reduce the gap patient-doctor. 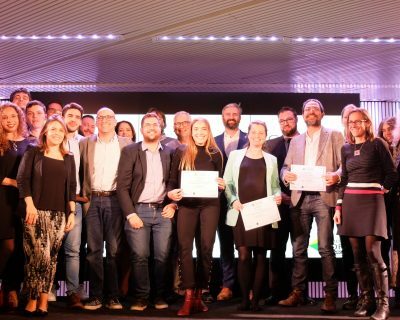 Start-up Slam, Barcelona, pitching competition!